This is a 48-foot catamaran scheduled regularly for sailing and snorkeling trips to the outer reefs. With a crash course on Bermuda's marine life, guided snorkeling trip, kayaks & paddle boarding, plus fresh cookies on board, it's hard to resist this excellent outfitter. Out of many boat tours that we have taken in Bermuda, Restless Native remains one of our favorites. 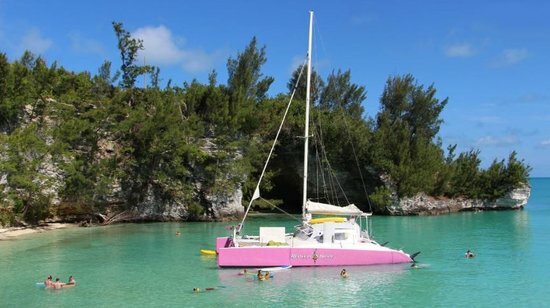 The boat is popularly known as the pink catamaran. We boarded the catamaran right next to the pier where our cruise ship docked at the Royal Naval Dockyard. On the boat we met the crew: Kirk Ward the captain, Tom the cookie baker, and Karen, one of the best guides we had the pleasure of knowing. Tom made delicious chocolate chip and oatmeal cookies on our sail across the bay to a secluded cove that was ideal for snorkeling. Karen would usually show the pictures of the fish we were likely to see on the reef. She told us everything about those fishes, including their names, feeding and mating habits and what role they played in the reef ecosystem. We soon reached a secluded cove with a beautiful little beach. They lowered the stairwell which dropped us off into waist deep waters. 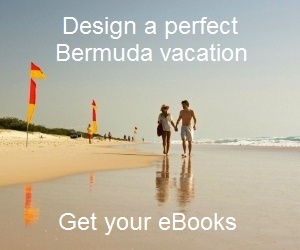 With soft sand under the feet, we could easily get adjusted to the water and the surroundings. You could either decide to snorkel at the shallows where the boat anchored or choose to follow the guide (Karen in our case) to go to deeper water for reef snorkeling. It was just a short swim to one of the most beautiful reefs I have ever snorkeled at. There were hundreds of colorful fish. Karen swam right along with us with a "flag" on her mask so that we could easily spot her. She pointed out any fish that she had not discussed. We had about one and half hours to explore the reefs. You can also enjoy hammock and try out kayaking and paddle boarding here. On the way back they served rum swizzles and more cookies. They have a cash bar and you can purchase alcoholic beverages in case you like to have something other than swizzles. All along there will be nice island music played and conversation style commentary given about Bermuda. They also have a nice little store on board with shell necklaces and other small local items. Restless Native also offers Sunset & Swizzle boat tour to enjoy lovely sunsets while you seep in Rum Swizzles. Complimentary Bottled water, Orange & Pineapple juice are included in all tours. Restless Native Catamaran can also be booked for private charters for 2-5 hours up to a party size of 50. The catamaran is equipped with a full bar, four interior dining tables, a music library, an iPod dock and restroom facilities. Snorkel Boat tour is $65 per adult and $55 for child between 3-12 (duration 3.5 hours). The cruise duration of the tour is 3.5 hours out of which about 1 hour is sailing and remaining time at a cove with a nearby reef for swimming, snorkeling etc. The Sunset & Swizzle tours are $45 per adult (1.5 hours). They also offer their boat tours through the cruise ship excursions. Restless Native boat tours depart from in between Heritage Wharf and Kings Wharf cruise berths in Royal Naval Dockyard. The dockyard is connected with Hamilton by regular blue route ferries (takes 20 minutes) and buses (routes #7 and #8). 4) Bermuda Activities: All the recreational activities in the island.